The Beantown Bloggery: Ned Devine's Wins Chowderfest! 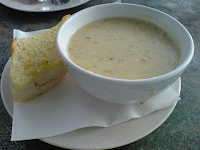 Congratulations to Ned Devine's for winning yesterday's Chowderfest 2009 (here)! Sadly I didn't make it back from NH in time, but I did get a call from my friend Carl saying that he and a group of folks were heading over to check it out. I'll have to ask him what he thought of the Ned Devine's chowder when I see him next. Ned Devine's Irish Pub has won a New England clam chowder contest called Chowderfest for the third time and has been elected to the event's Hall of Fame. Manager Greg Springer says it's fantastic New York City chef Sean Ryan's 20-year-old recipe did so well. The 28th annual Chowderfest was held Sunday as part of Boston Harborfest, a Fourth of July festival showcasing the city's heritage. My friend Michelle is visiting in a few weeks from Arkansas. I wonder if I should take her to Ned Devine's instead of Legal's. What do you think? 0 Response to "Ned Devine's Wins Chowderfest!"